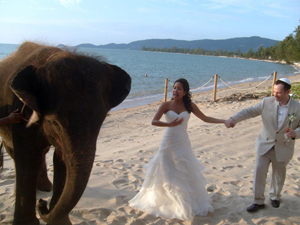 Nad and Alex on the beach for their wedding — with a baby elephant! With guests from Australia, France, Germany, Italy, Russia, Thailand and the U.S. present, Nad and Alex’s wedding was easily one of the most cosmopolitan I had ever officiated. With a fairly traditional inclusive Jewish ceremony, bookended by Thai customs, it was definitely one of the most intercultural. Throw in the fact that I was upstaged by an elephant, and you have the backdrop for a great story! While one might think that the coupling of a Russian Jew and a Thai Buddhist might be a challenge, this bride and groom showed that it need not be so. This may just be because the bride, Nad (short for Nadusa), and the groom, Alex, who live in Australia, are true citizens of the world. Nad was born in Thailand, but grew up mainly in Australia and Europe, due to her father’s work for Royal Thai Airways. She was schooled in an international school in Paris, and is fluent in (standard American accented) English, French, German and Thai. Alex was born in Russia, and he grew up there and (from age 15) in the U.S. He trained as a radiologist at Harvard, and practices a specific type of medicine that embodies the global village we live in. If you ever have an x-ray done in the middle of the night, you may wonder where on earth they find a radiologist to read it. Well, on the bottom part of the earth, that is where! It may, in fact, be Alex, a “nighthawk” radiologist, who by virtue of being in a very different time zone, will, during what is day for him, get a report back to your stateside doctor. Nad also (naturally) works for an international corporation. The couple reflects a cosmopolitan life not only in their upbringing, their professional lives and their personal day to day lives, but also in their philosophy of living. They are both very proud of their cultural heritages, but in terms of actual religious beliefs are much more humanistic in their leanings. 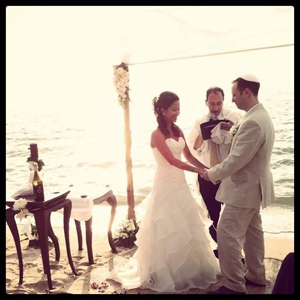 They wanted their ceremony to reflect this, and their idea of how it would was to have a fairly traditional, while inclusive, Jewish ceremony, with Thai customs before and after it. For the location, they chose Koh Samui, a small picturesque island in the southern part of Thailand. Their exciting beachside ceremony began with the sound of the beating of a gong and drums and men we could not yet see, shouting in Thai, “Here we come, we are here,” as they drew closer. The first thing we then saw was four ornately and traditionally dressed young Thai women, swaying slowly as they processed. We then saw the men we had heard before, followed by the “guest of honor” – a baby elephant! The elephant was decorated with ornate jewelry and was dancing too. They brought in the groom, and sat him next to the bride. One of the men then set up a xylophone, and the four women danced to its music an elaborate synchronized dance in front of the bride and groom. They ended by spreading before them a bed of rose petals in perfect synchronization. I then officiated the Jewish portion of the ceremony under a lovely chuppah (Jewish wedding canopy) on the beach. They exchanged heartfelt vows and rings, and shared a cup of wine. They signed an attractive ketubah (ceremonial Jewish marriage contract) written in Hebrew, English and Thai. (Nad’s mom, a professional translator, helped with the translation.) I then blessed them with the Priestly Blessing, which is the most ancient copy of scripture archeologists have found in Israel. I explained how our forefathers, those who gave us the Torah, imagined my mythic ancestor, the first high priest, Aaron, brother of Moses, blessing the Children of Israel with these very words. I love reciting this blessing in a third language (aside from Hebrew and English) when appropriate. In fact, I have blessed couples in Spanish (I do live in Tejas, after all), French, Arabic and Bulgarian. This time I used four languages, as I blessed Nad and Alex with the words of my great ancestor and theirs in Hebrew, English, Russian and Thai. After the Jewish portion of the ceremony, we observed more Thai customs. We all got to feed the baby elephant. This “baby” ate whole clusters of bananas and watermelon quarters. The elephant also danced some more while playing the harmonica. (Seriously.) In Thai culture the elephant is the symbol of the king, and therefore in a broader sense is used to symbolize the nation and its happiness. Nad and Alex then planted a small “love tree” together, and raised a “marriage flag” on a tall staff. The final Thai custom was most interesting. Guests were invited to light small paper-covered lanterns. Once lit, by the virtue of the hot air inside, these rose far into the air, till they looked like far away stars. Each guest was encouraged to make a wish upon these stars for the good fortune of the bride and groom.